As I’ve been working on Osana, I’ve been fixing a few bugs here and there. Now, there have been enough bug fixes to justify a new build, so here it is! To read a list of everything that is new in the latest build of the game, scroll down past this pretty artwork by Jinko! Replaced the animation that the students perform when they are waiting to perform a group takedown (or waiting to attack Yandere-chan for any other reason). Fixed bug that could cause a student to prioritize a giggle or a loud radio over instructions from Yandere-chan (following, distracting, or going away). Fixed bug that would prevent Yandere-chan from asking a student to follow her anywhere, if a student was splashed with water while following her. Fixed bug that would cause Yandere-chan to continue performing a “carrying” animation if she got a game over while carrying something. 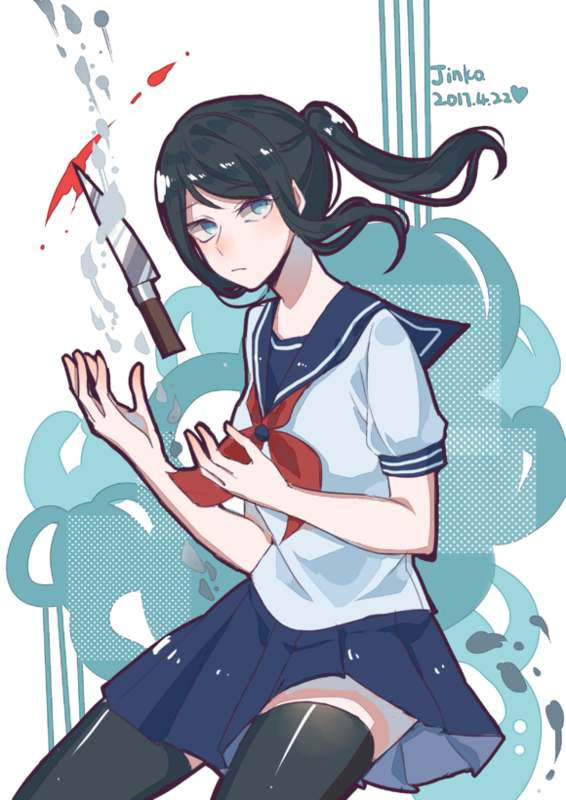 Fixed bug that would cause Yandere-chan to continue holding weapons in her hands even when pick-pocketing someone. Fixed bug that would cause Yandere-chan to continue holding a corpse even when she was about to be apprehended. Fixed bug that would cause Kokona’s “censor steam clouds” to disappear after she had witnessed murder. Fixed bug that would allow Yandere-chan to send a student to distract another student who was dead. Fixed bug that would allow Yandere-chan to pickpocket someone while being chased. Fixed bug with the shower particle effects in the girls’ locker room. Updated Yandere-chan’s “about to be apprehended” animation. looks like you are finally having some good progress on osana, this makes me glad to see we are past the point of being stuck. I can not wait to implement Osana in the game !! Sending people to distract dead people could be an idea.. making them go and find the body and if the body isn’t ripped into tiny pieces they’d go to check the person and you could take a blackmail photo of them with the body! There was a bug that could allow Yandere-chan to send a student to distract someone who wasn’t at school because they were dead. I was wondering if you was gonna add the Yakuza to the character page? Haha… “Jinko”… Bongou Stray Dogs anyone? Yay, a build on my birthday!!! Keep it up, YandereDev! Unity 5 is doing so well for you! Any one else notcie the yandere dev has not been puting the “thanks for folowing the develpment of yandere simulator” at the end of his bug fix’s lately? Also yeah develpment on osana! He only says that at the end of his videos, Jamani Brown. b r o first of all, there is a JSON file. its within the game. I’m not sure actually how you got this message. Did you see a youtuber get it? If you don’t know where or what a JSON file is, then you couldn’t have gotten the message. second of all, don’t yell at yanderedev for your own stupidity. Redownload the game and see if that fixes it. Learn some manners and grow up. Nope. No issues here. It must be something you did. Empty your Yandere Simulator folder and try again. This time, load the game without editing the students.json file. Fun Girl only shows up because you did something stupid. Yandev has reworked the “lets put Osana in the game because she’s clearly ready” kick-you-out routines. Some people claim to have already found another workaround, but why would you even want to hack in a character that’s not finished yet? Redownload it then. Please calm down and relax! you can do a elimination method or use easter eggs or pose mode! Hey guys, I have a question regarding the game. I’m trying to update my game but I always get a message telling me to move the game to my C-Drive Program Files. I did that (copy and pasted the files there), but it’s still not working. Help is appreciated! I have it on my F: Drive and it works fine. This question may have been asked already, but do we know if there are any plans to adapt the game for both PC and Mac computers? I’ve been playing the game on my desktop computer, which uses Windows, but it’s pretty old and not going to last out the year, which will only leave me with my Macbook Pro laptop. all this progress makes me SO excited for Osana! it seems like she will be coming soon! And? He makes a game, I only intend to buy it from him not plan to get married here. who are you speaking too, Neko? are you speaking to Lavandere or Legit? Does this game work on ASUS?